Piano lessons at Lorien Music Lessons are offered to both children and adults in classical, rock, pop and other genres. Beginners start with the essentials, for example getting familiar with the names of the keys, reading notes and rhythms, playing one hand songs and progressing to two hand exercises. Advanced students continue developing more difficult techniques and play more significant repertoire. Whether you want to learn John Legend or Beethoven, we can help you combine your favorite tunes into our lessons. While we accent on the core principles and the fundamentals necessary for all levels of performance, our students continue their development through the piano curriculum and acquire significant repertoire. We also have music theory, ear training, sight reading, and music history included in our piano instruction. Lorrien Music Lessons offers piano lessons in 30 min., 45 min., and 60 min. sessions. The length of the lessons depends on the age and level of the students and their commitment. The instruction is led by university trained music teacher with degrees in violin, piano, and music education. Music theory learning and ear training have been integrated in all private lessons to aid student’s growth in their way of becoming professional musicians. 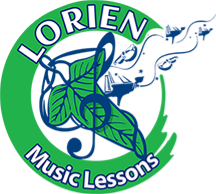 Lorien Music Piano Lessons are for all ages, interests and levels. We provide exciting and engaging instruction in a very friendly environment. Our goal is to achieve the best possible learning in a well-tailored curriculum that meets the individual needs of our students. ​As early as 14th century in Europe the keyboard family progressed with a new instrument called a harpsichord. Its imperfection was the lack of dynamic keyboard therefore soft and loud dynamics could not be performed. The desire of many musicians to be able to express different dynamics led to the invention of the piano in Padua, Italy in 1709. The harpsichord maker Bartolomeo di Francesco Cristofori revealed his new instrument that was named gravicembalo col piano e forte (meaning “soft and loud keyboard instrument”). It was later shortened to fortepiano or pianoforte, and finally just piano. Nowadays piano is used in any genre of music from many great performers, everywhere in the world.